As the world eagerly awaits November 9 to16 when the much-publicised 4th edition of the Africa International Film Festival (AFRIFF) will come up, one remarkable move by the organisers to create a sense of harmony among filmmakers in the continent is the endorsement of notable South African actress, Xolile Tshabalala, as Goodwill Ambassador of the festival. 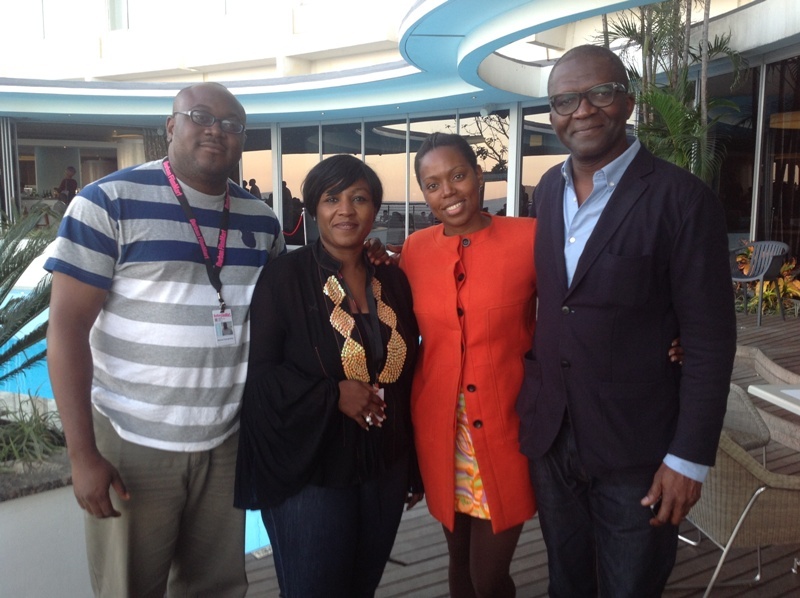 Tshabalala met with the AFRIFF team at the ongoing Durban International Film Festival (DIFF), where she held talks with the Project Director Afie Braimoh and the Artistic Director Keith Shiri who joined the team from London. The actress, whose short film, Through Her Eyes, is screening at DIFF, was excited to join the team, having been eager to lend her voice to projects that promote Africa. “I’m very excited as an artiste and as a female filmmaker. Also, as an African, I am so happy about anything that brings Africa together and puts us on the world map. I’m overwhelmed with joy for being a part of the AFRIFF team,” she said to reporters at the festival. The star of Mnet’s Jacobs Cross and SABC1’s soap, Generation, alongside Nollywood actress Rita Dominic, will be the ambassadors for the festival. Interestingly, Tshabalala resumed duty immediately, talking to people at the ongoing DIFF about the qualities that differentiate AFRIFF from other festivals. The actress, who has already marked the festival date in her diary, further added that it would be her second time in Nigeria, when she arrives on November 8, a day to the festival’s opening ceremony. AFRIFF holds at the popular Tinapa Business Resort in Calabar, Cross River State. The event will feature daily film screenings, workshops, master classes, exhibitions, film premieres, glamorous opening and closing ceremonies. It will round off with an award night that will celebrate winning film entries as well as their cast and crew. Tshabalala’s Through Her Eyes, a ‘Man’s World’-themed film will also be showing at the festival. Although her first stint with Nigeria was in Abuja, she cannot wait to witness Calabar, a city she learnt is the tourism hub of Nigeria. “When Chioma Ude, the founder of AFRIFF, called me, I had no choice but to jump at the offer-perhaps, it is also because it’s woman power. “Yes, the festival is being run by an amazing woman. So, I feel excited about an opportunity for me to share my experience and belief about the beauty of Africa. More importantly, I am excited because it will also offer the opportunity to show that AFRIFF has demonstrated that she can hold a film festival equal to internationally acclaimed festivals,” she said. Born in Vrede in the Free State, the 37-year-old actress is best known for her role as Julia Motene in Generation. She also played alongside her mentor, Thembi Mtshali, in The Crucible at the Market Theatre. She enrolled at the National School of the Arts and graduated with the honour of best overall performer. She has worked on other television productions, including Justice for All, Scoop Schoombie, Isidingo, Secret in my Bosomand Soul City, among others. Xolile, as she is simply called, has received a number of acting awards, including Duku Duku Viewers Choice award (2003) and People Magazine Crystal Award for Best Soap Actress (2004), among others. She took a break from acting in 2005 to attend the New York Film School, honing her skill as a film producer and director. She played the role of Sister Zama in the seventh season of the SABC1 drama series, Soul City (in 2006) and played a guest role in the fifth season of the American drama series, NCIS, in 2007. She starred as Mandi Mbalula, Mvelo’s (Yonda Thomas) father’s calculating accountant and second-in-command at Nobela Holdings in the SABC1 drama series, Fallen, in 2011. She also starred as TT’s gorgeous wife Gugu, an ambitious player development executive who gives the casino’s high rollers whatever they want, but is unable to give TT the one thing he wants- a child- in the SABC3 drama, series High Rollers, in 2013. Xolile is also popular for her campaign about being natural, leading that line with braids and Afro-hairstyles alone. South African actress Xolile Tshabalala appointed AFRIFF 2014 Ambassador 0 out of 5 based on 0 ratings. 0 user reviews.